Saluda Outfitters has opened a full-service bicycle shop managed by veteran bike technician and fit specialist Jonathan Tumas. Tumas brings 20 years’ experience in the bicycle industry to the new shop located on the lower level of the outfitter. A Giant bicycle dealer, the outfitter can now provide mechanics, sales, fittings and all aspects of biking needs for beginners to the most experienced riders and on any type of bike, said Tumas, who is already hard at work at the shop. A recent transplant to Saluda, Tumas is a native of New Bern, N.C., and most recently lived in Charlotte where he has worked for both Bike Line of Charlotte and BikeSource as a mechanic and in sales. Among his other experience, he worked as systems manager for Hilltop Bicycles in New Jersey and as general manager for Sid’s Bikes in New York City. Tumas studied civil engineering at UNC Charlotte and holds certifications from SBCU (Specialized Bicycle Components University), Trek University, Shimano S-Tec, Sram Technical University and DT Swiss for wheel building, among others. On the retail apparel side of Saluda Outfitters, be sure to stop by to check out the spring line of clothing that continues to arrive daily and includes Elan fashions for women and Howler Bros for men. Also, our latest durable and comfortable sock lines for cycling, running, hiking or any other sport such as golf or skiing include Swiftwick, FITS and Smartwool. We now carry a select group of Astral shoes in our expanded shoe department. A sales corner provides convenient shopping for all sales items in the store, which includes any fall/winter fashions still on hand at great prices. As summer is just on the horizon, don’t forget to enroll your youth in the area’s closest kayak day camp. The Green River School-Youth Kayak Day Camp conducted by Chris and Lydia Wing at H2o Dreams and based at Saluda Outfitters, offers youth ages 8 to 16 opportunities to become familiar with whitewater paddling while learning about the environment and protection of our water resources. The first session begins in June. To register, contact the Wings at (828) 767-7109, email info@h2odreams.com or register on the website at www.h2odreams.com. Saluda Outfitters, located at 435 Main St., just one mile off I-26 at Exit 59 and Ozone Road, continues regular hours 10 a.m. to 6 p.m. daily, and open until 7 p.m. on Friday and Saturday. The shop will be open regular hours Easter Sunday. For information, call (828) 848-4060. If you have driven down Ozone Road to Highway 176 into Saluda lately, you most likely have noticed the construction occurring at Saluda Outfitters on the hill. It looks massive and it is. The owners are adding a large open deck with some inside renovations that will add a taproom to the facility. This expansion will allow more space for enjoying the atmosphere of historic Saluda while shopping at the outdoor adventure retailer, enjoying a cold craft beer or glass of wine and in the spring, some great live music. There is no specific date for opening the taproom yet, but Hendrix and the owners say an announcement will be coming soon. Hendrix added that the spring line of Elan clothing displayed in the ladies’ boutique has begun to arrive, and an array of spring outdoor and adventure apparel is on the way. Come by to check out the updated supply of NRS jackets and great discounts on winter clothing. In other news, H20 Dreams Paddling School, based in Saluda in close proximity to the fabled Green River and conveniently housed in Saluda Outfitters is adding a youth day camp to its agenda. The core team of husband and wife Chris and Lydia Wing remain steadfast in providing the best paddling experiences in the industry by never ceasing to be students themselves. New for 2018 is their offering to the summer camp world, The Green River School, a youth whitewater kayaking day camp. Available to aspiring river paddlers of all abilities, this bi-weekly, five-day camp is an affordable and exciting option for youngsters ages 8 to 16 this summer beginning June 11. The only prerequisite skill is an ability to swim. H20 Dreams can accommodate younger campers with a prior lesson and in-person interview. To register, contact the Wings at (828) 767-7109, email info@h2odreams.com or register on the website at www.h2odreams.com. Saluda Outfitters, located at 435 Main St., just one mile off I-26 at Exit 59 and Ozone Road, continues regular hours 10 a.m. to 6 p.m. daily, and open until 7 p.m. on Friday and Saturday. Shop locally while gearing up to get outside and enjoy the pending spring and the variety of outdoor adventures provided in the Saluda area. 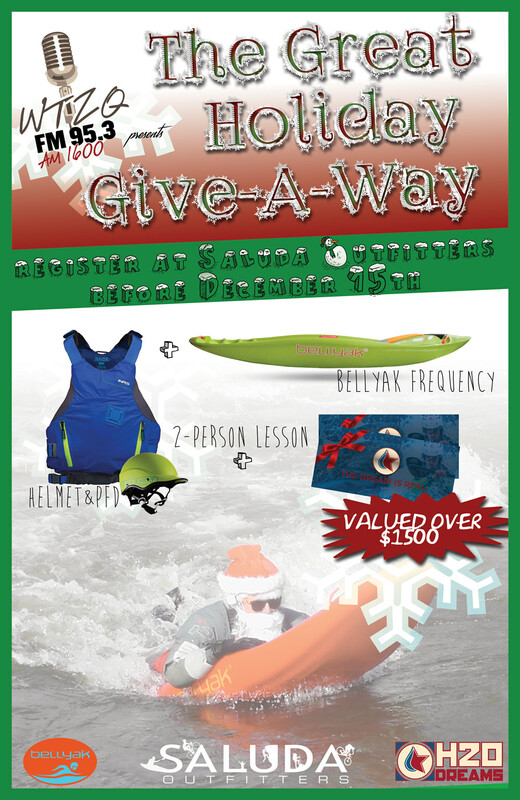 Congratulations to Don Bryant of Flat Rock, N.C., for winning the Bellyak prize package sponsored by Saluda Outfitters during WTZQ 95.3 Radio’s The Great Holiday Give-A-Way. We appreciate everyone who dropped by the store to register and hope that, although you didn’t win the big prize, you walked away with some great deals for your holiday shopping. January is a quiet month in Saluda, but Saluda Outfitters will continue to offer some great shopping deals worth coming to town to check out. Be sure to stop by New Year’s Day as we begin our after Christmas sales that will continue throughout the month. There is always something special for those birthday and anniversary gifts and we make gift giving easy with our gift cards. In addition to some great outdoor clothing and adventure gear, we have a very fashionable ladies boutique and a selection of Giant bicycles. As we begin the new year, be sure to stop local. The store, located at 435 Main St., just one mile off I-26 at Exit 59 and Ozone Road, will continue regular hours 10 a.m. to 6 p.m. daily, and open until 7 p.m. on Friday and Saturday. Here is wishing everyone a safe and happy 2018. Come shop with us, gear up and get outside for some great adventures this year. Saluda Outfitters will be closed on Christmas Day and open on New Year’s Day from 10 a.m. to 6 p.m.
Our first holiday season open in Saluda is an exciting time and we have lots of great holiday deals running through Dec. 24. We’re also offering our customers a unique chance to win an outdoor adventure package, valued at more than $1,500. Be sure to pop by the store to check out details about The Great Holiday Giveaway, a promotion with WTZQ 93.5 FM/1600 AM, where customers can sign up to win one of three grand prizes valued at $1,500 or more each. The Saluda Outfitters package includes one of Bellyak of Asheville’s finest prone kayaks. Called the Frequency, the boat is a wasabi green and will look super great surfing the Green River Narrows. Also included in this package is a fitted safety helmet and personal flotation device (PFD) so the winner will have the gear needed to hit the water in style. To complete the prize package and to ensure a safe experience, H2O Dreams, a company located here at 435 Main Street that provides certified whitewater instruction, has included a gift certificate for a two-person lesson. Don’t wait to get registered. One winner for each of the three grand prizes will be drawn on December 15. Get your registration in by Dec. 14 to make sure you have a chance to win. In additional to this promotion, the Outfitter has everything you need for your holiday shopping, including a “build your own” gift set for $79 (a regular $115 value). This includes a short sleeve T-shirt (excludes performance tees or NRS brand), pair of underwear, pair of socks, a baseball/trucker hat, and a sticker from among the stores wide selection. You can also captures these super deals: 20% off all regular priced shoes, Outback coats, vests and hats, Wolverine clothing, Gregory and Osprey backpacks, all Mountain Hardware, and Marmot tents and sleeping bags. You can save 10% on Kuhl and Marmot clothing as well. In our ladies boutique check out the 40% savings on all our Krimson Klover fashions. The store is loaded with stocking stuffers from Smart Wool or Farm to Feet socks to Umpqua fishing flies. Be sure to stop local. The store will continue regular hours 10 a.m. to 6 p.m. daily, and open until 7 p.m. on Friday and Saturday, and only closing on Christmas Day. We’re happy to say we’ll be open until 8 p.m. on Saturday, Dec. 8 to help celebrate Saluda’s Hometown Christmas! Hope you’ll stop by for a sweet treat. Wishing everyone a safe and happy holiday season. For unto us a child is born…Isaiah 9:6. The next Carolina Foothills Business After Hours will be held on Tuesday, November 14th, at Saluda Outfitters, located at 435 Main St. in Saluda NC. The event will be co-hosted by 2 Minute Miracle Gel/Zija International. Saluda Outfitters opened this Spring and has quickly become a favorite retailer with an extensive array of top-quality performance apparel, outdoor camping, kayaking, and paddle boarding equipment and supplies and also a weekend entertainment venue with local and regional live music on the back patio, and serving beer and wine. 2 Minute Miracle Gel is a clinically proven, 7-in-1 topical product that harnesses powerful ingredients that gently renews skin without any abrasives, leaving soft glowing skin in just 2 minutes, and you will be able to try a sample at the event. All Chamber members are invited to attend, and be sure to bring your cards to share and for door prizes. “After 5” beverages and appetizers will be served during the 5:30 to 7 PM event. RSVP is a must by calling the Chamber at828-859-6236 or email to janet@carolinafoothillschamber.com, by Monday November 13th at 5 PM.